Listen to "The Purpose Driven Life: What on Earth Am I Here For?" on your iOS and Android device. 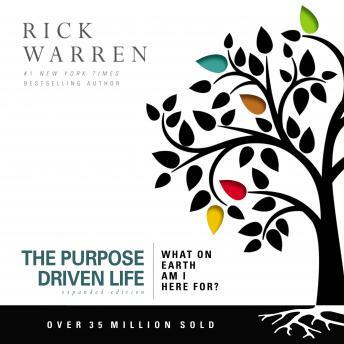 The New York Times #1 bestselling book by Pastor Rick Warren that helps you understand the purpose of your life. As one of the best-selling nonfiction books in history, with more than 34 million copies sold, and more than 70 translations available, The Purpose Driven Life is far more than just a book; it's the roadmap for your spiritual journey. A journey that will transform your life. The Question of Existence: Why am I alive?The Question of Significance: Does my life matter?The Question of Purpose: What on earth am I here for?Living out the purpose you were created for moves you beyond survival or success to a life of significance - the life you were meant to live. It will explain the meaning of your life.It will simplify your life.It will focus your life.It will increase your motivation.It will prepare you for eternity.The Purpose Driven Life is designed to be read in 42 short chapters that will inspire you to stop and realize how God uniquely designed you for a purpose only you can fulfill. It also includes links to 3-minute video introductions to each chapter and a 30 to 40-minute audio Bible study message for each chapter. There are also appendixes including questions for further study and additional resources. Before you were born, God already planned your life. God longs for you to discover the life he created you to live - here on earth, and forever in eternity. Let The Purpose Driven Life show you how. The Purpose Driven Life is available in audio book, ebook, softcover, and hardcover editions. Also available: The Purpose Driven Life video study and study guide, journal, devotional, book for kids, book for churches, Spanish edition, Large Print edition, and more. The main thing I walked away with is that each person determines their purpose in this life. When you are working at your purpose it will feel natural and you will love doing it. It's up to each person to determine it. The book just gives assistance to figure out what your purpose is. This is a very interesting book. I got it on Audiobooks. Horrible theology, works righteousness mantra. This is feel good, rock-roll, american pop evangelism. What Warren is selling is the gospel of Rick Warren not Jesus Christ. His biblical quotes are often out of context and he uses "The Message" translation 92 times in this book. The Message is a ridiculous source for anything. Google search The Purpose Driven Deception on You Tube, it runs 1hour 57minutes. Very revealing!